Figure 3. Time-course immuno-blot (A,C) and RT-PCR (B,D,E) analyses of GlbGus tobacco seed after-ripening. Regions 1 and 2 represent the early (major ßGlu peak and promotion of testa rupture) and the late after-ripening period, respectively (see Fig. 2). (A) Immuno-blot analyses with the anti-tobacco ßGlu I antibody of protein extracts at different DAH during after-ripening. 'ßGlu I', 10 ng of pure tobacco 33 kDa ßGlu I protein. (B) Semi-quantitative RT-PCR of ßGlu I transcripts. RT-PCR and subsequent nested PCR with ßGlu I-mRNA specific primers (one of which spans the intron-splice site) generated a 708-bp ßGlu I cDNA amplification product. The 443-bp rRNA PCR product was co-amplified with primers specific for 18S rRNA and served as internal standard. (C) Immuno-blot analyses with the anti-E. coli Gus antibody. '35S', protein extract from Gus-over-producing transgenic 35SGus tobacco; 'Gus', commercial E. coli Gus protein extract used as standard. Note that the intact Gus protein corresponds to the 72-kDa antigen and that this antibody is known to detect additional bands. (D) Semi-quantitative RT-PCR of Gus mRNA generated a 620-bp Gus PCR amplification product. 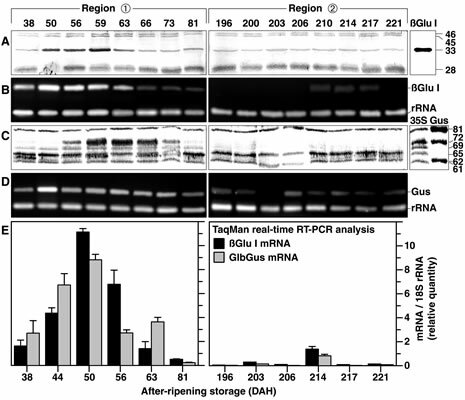 (E) TaqMan real-time RT-PCR analysis of ßGlu I and Gus mRNAs. Transcript quantification with specific TaqMan MGB probes was performed in multiplex assays with 18S rRNA as internal standard. Figure 4. Spatial analyses of ßGlu I expression in air-dry GlbGus tobacco seeds during after-ripening. (A-C) Histological Gus staining during the release of coat-imposed dormancy (region 1). Blue staining due to ßGlu I-promoter activity is localized in the inner testa. The staining was achieved with intact DAH60-seeds (A) or with seeds after removal of the outer testa (B,C), and either without (A,B) or with (C) seed dissection. 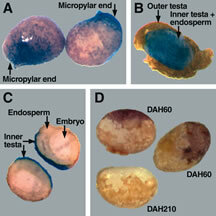 No Gus staining was detected in DAP210-seeds and in wild-type seeds. (D) In situ immuno-histological analyses of DAP60- and DAP210-seeds with the outer testa removed. Staining is indicative for the localization of ßGlu-antigens detected by the ßGlu I-specific antibody.